IT was a case of honours at Brandywell Stadium on Monday night as Derry City and Cork City couldn’t be separated leaving Champions League chasing Dundalk as the only real beneficiaries of a frustrating game. The draw was probably the fair result as both sets of defences were on top throughout. Kenny Shiels kept faith with the side which hammered North West neighbours Finn Harps 5-0 in Donegal on Friday night but the home side were forced into a change after just 10 minutes with skipper Ryan McBride having to be replaced by Patrick McClean. The skipper’s ongoing groin problem flared up once again and he had to be replaced and now faces a spell on the sidelines. 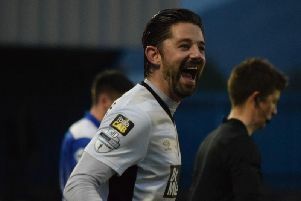 The Candy Stripes started the better and although they didn’t test keeper Mark McNulty, Nathan Boyle’s pace was tormenting the Leesiders’ back-line, with veteran Dave Mulcahy in all sorts of bother in the early stages. On 40 minutes Rory Patterson had a glorious chance but his close range over-head kick was easily saved by McNulty after Lukas Schubert had initially caused the visitors problems inside the box. The Candy Stripes started well in the second half and were inches away from taking the lead but Patterson’s long range strike, which had McNulty beaten, sailed just wide. Minutes after the hour mark, Derry keeper Gerard Doherty was called into action but he easily caught Mulcahy’s tame header after Gearoid Morrissey’s cross had picked out the ex-Bohemians man. In a game of few chances it was Derry who went close on 78 minutes after substitute Joshua Daniels set-up Patterson, but his drive from just inside the box flew well over. Moments later Cork substitute Karl Sheppard went close but his 20 yard drive flashed just wide. With both teams struggling to fashion any real openings of note, it was Derry who went close again on 78 minutes after sub Joshua Daniels set-up Patterson, but his drive from just inside the box flew well over. Moments later Cork substitute Karl Sheppard saw his 20 yard drive flashed just past Doherty’s right hand post. Right at the death Cork had a good chance to win the game but substitute Sean Maguire could only direct his drive from just inside the box straight at Doherty. Derry City: Doherty, McDermott, McBride (McClean 10), Vemmelund, Jarvis; McEneff, McCormack; Schubert, McNamee, Boyle (Daniels 66); Patterson. Cork City: McNulty, Beattie (Sheppard 65), Bennett, Browne, O’Connor; D Morrissey (Maguire 52), G Morrissey, Mulcahy, Dooley, Bolger (O’Sullivan 81), Buckley.